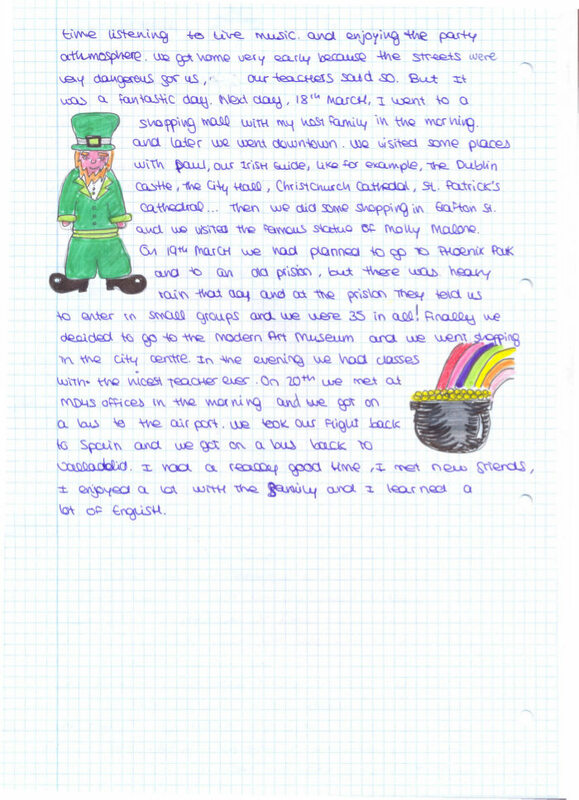 Last month I went to Dublin with my classmates on a school trip.On 13th March 2013 we left our high school and a bus picked us up and took us to Madrid airport. We took the slight to Dublin and when we arrived, after two hours and a half approximately, Gabriela was waiting for us and she gave us the typical st. Patrick's hat. Then we got on a bus and we met our host families. We had a lovely dinner with them. On 14th we got on the bus to the city centre and we arrived at ECM college. We had some English classes and we ate our lunch. Then, we had a walk around the streets near the college. We saw the post office and the spire. Then, we went to the national museum of Ireland of Chiefs and soldiers. It was full of army uniforms and UN vehicles. The next day Friday 15th we had classes and in the evening we had a walk around the city and we saw the Temple bar, the bank of Ireland, the natural and archaeology museum and the big park of st. Stephens Green. Then we walked through Grafton street, and we also saw trinity College. On 16th we had a lovely Saturday. We wake up at 6 o'clock and we got on a bus to Galway. At lunch time we arrived at the beautiful cliffs of Moher. We had lunch there and we enjoyed a walk around the cliffs with really beautiful views. In Galway we went to a shopping centre and we visited some squares near the mall. 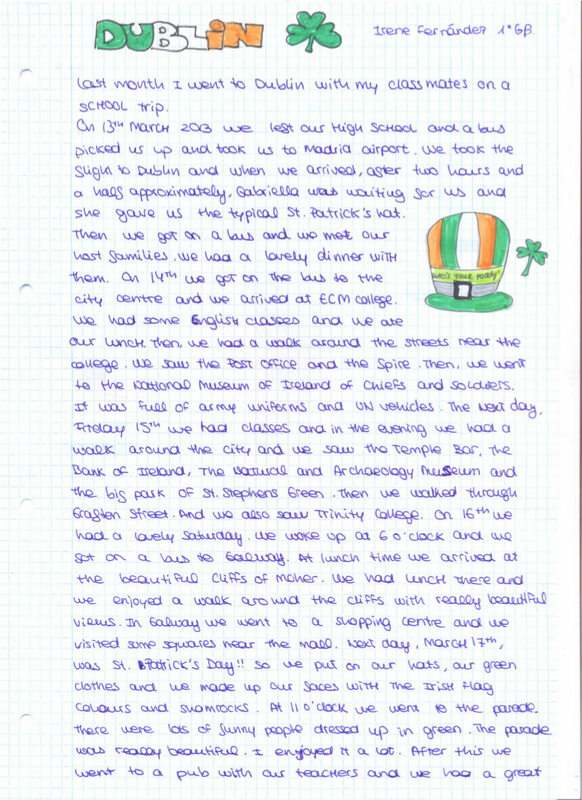 Next day, march 17th, was St' Patrick's day!! so we put on our hats, our green clothes and we made up our faces with the Irish flag colours and shamrocks. At 11 o'clock we went to the parade. There were lots of funny people dressed up in green. The parade was really beautiful. I enjoyed it a lot. After this we went to a pub with our teachers and we had a great time listening to live music and enjoying the party atmosphere. We got home very early because the streets we very dangerous for us, our teachers said so. But it was a fantastic day. Next day, 18th March, I went to a shopping mall with my host family in the morning and later we went down town. We visited some places with Paul, our Irish guide, like for example, the Dublin castle, the city hall, Christchurch cathedral, st. Patrick's cathedral... then we did some shopping in Grafton st. And we visited the famous statue of Molly Malone. On 19th march we had a plan to go to phoenix park and to an old prison, but there was heavy rain that day and at the prison they told us to enter in small groups and we were 35 in all! Finally we decided to go to the modern art museum and we went shopping in the city centre. In the evening we had classes with the nicest teacher ever. On 20th we met at MD4S offices in the morning and we got on a bus to the airport. We took our flight back to Spain and we got on a bus back to Valladolid. I had a really good time, I met new friends, I enjoyed a lot with the family and I learned a lot of English.